Stormwater management practices help minimize the impact of polluted runoff flowing into lakes and streams, and reduce the strain that stormwater places on municipal infrastructure. Stormwater refers to rainwater and melted snow that flows over roads, parking lots, lawn and other sites in urban areas. Under natural conditions, stormwater is intercepted by vegetation and then absorbed into the ground and filtered and eventually replenishes aquifers or flows into streams and rivers. 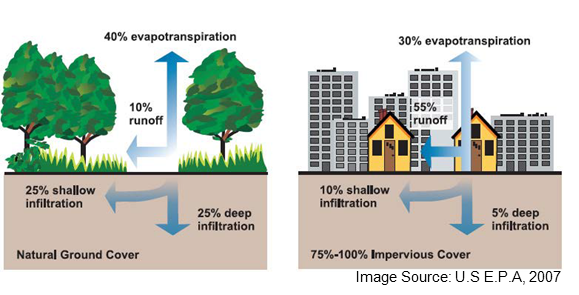 Later, part of it is returned to the atmosphere in the form of evapotranspiration. In urbanized areas, however, impervious surfaces such as roods and roofs prevent precipitation from naturally soaking into the ground. Increased downstream flooding risksRiver bank and bed erosion. Changes in the stream flow regime. Contaminated streams, rivers, and coastal water. To preserve the natural hydrologic balance in newly developing areas and re-establish it, wherever possible, in already developed areas. To protect and enhance quality of stormwater discharged to lakes and streams. To reduce the volume and frequency of combined sewer overflows in older urban areas.